I'm not sure what got me into making this recipe today. I'm in a bit of a post half marathon funk really. You'd think I'd be ravenous, but I'm right off my food at the moment. I think it's something to do with running 13.1 miles in blazing sunshine bringing back the lovely sinusitis and chest infection that I'd been battling with for three weeks prior to the run. It held off for the big day and then came back with a vengance. That coupled with post race stiffness is making me feel a little lacklustre. Nevertheless, I'm still healthier than a lot of people and the blog still needs keeping up (post 172, day 169 due to a few double blog days). 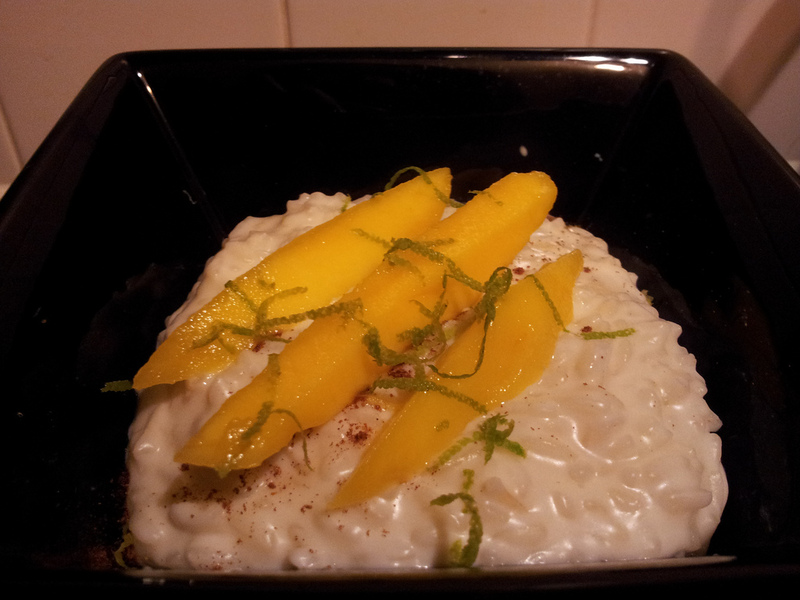 So I settled on the rice pudding which I've been meaning to make ever since I got my copy of Nigella Bites back in 2001. Eleven years is a long wait. And was it worth it? Well I adapted the recipe slightly because I had some coconut cream left over in the fridge. I may not be here tomorrow as it said on the carton to only keep for two days after opening it. I opened it 12 days ago when I made a Thai prawn curry. It looked okay. I couldn't tell what it smelled like thanks to a bunged up nose. But what the hell. In it went. The recipe uses arborio rice rather than the traditional short grain and involves lots of ladling and stirring just as if you were making a savoury risotto. I must admit I was lazier than Nigella and just poured bits in every now and again. She ladles hers tablespoonful by tablespoonful. But then again, I believe her fussy husband only eats weetabix or boiled eggs whereas I had to cook a slightly more complicated meal for my husband tonight whilst also tending to the rice pudding. Heat the milk and coconut cream in a saucepan until the coconut cream has melted. Pour into a measuring jug (or you can leave in the pan and use another pan to make the rice pudding in). Melt the butter and 1 tbsp of sugar in a clean pan over a medium-low heat. Add the rice and stir for two minutes until well coated in the butter and sugar. Add a small amount of milk to the rice and cook until nearly absorbed. I probably did mine about 75ml at a time, Nigella does this tablespoon by tablespoon. Repeat until the rice is tender. Start tasting after about 25 minutes but be prepared to wait for 35-40 minutes for the perfect texture. Add the other tbsp of sugar (or more depending on your taste). Serve topped with fresh mango slices and lime zest or other fresh fruit.